Something very strange happened as I approached Southampton. I was just coming over the flyover and I saw the famous P&O buff coloured funnel just pulling away from Mayflower Terminal. 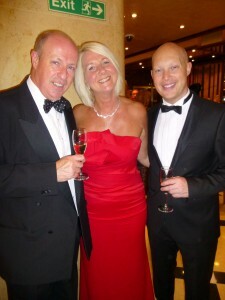 It turned out to be P&O Oceana. Normally I would be excited at the sight of a P&O funnel, strange but true, but this time it was a bit of a non event. But, as City Terminal came into view I felt my heart skip a little beat as I spotted an Oceania Cruises logo on a funnel. I hadn’t expected to see that sat there. It was in fact Oceania Marina which is the identical sister of the Riviera that I have just returned from. How I didn’t manage to bump into other cars on the dual carriageway I don’t know. 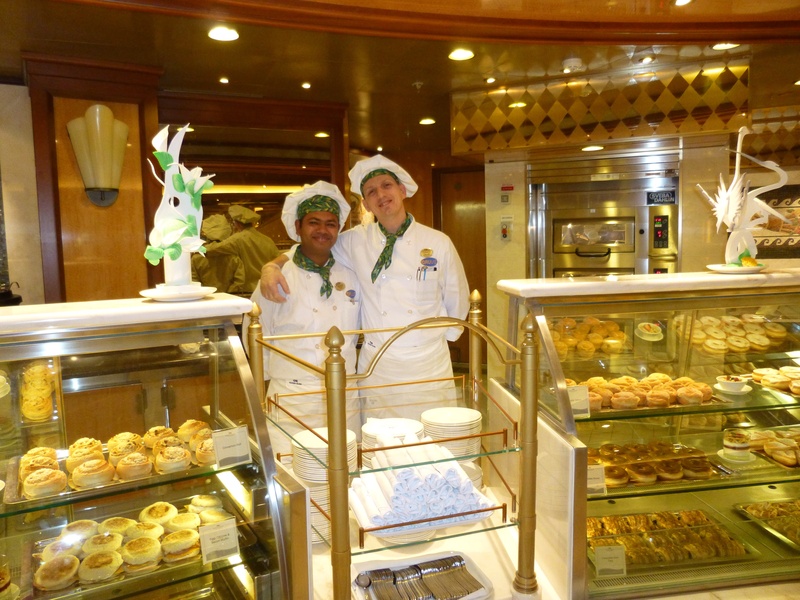 Yes, its true to say that Oceania Cruises has stolen a little bit of my heart. 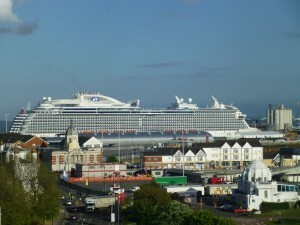 By the time I got into the Holiday Inn car park P&O Oceana was just passing Mayflower Park. It was only just gone 4.00pm and she was slipping out very quietly without anyone really taking much notice. I was checked into Holiday Inn by the ever welcoming staff on reception and allocated an executive room on the fifth floor overlooking the park. There was a Princess ship sitting in Ocean Terminal, but my brain must have disengaged because it did not click with me that it was the brand new Royal Princess. Must have been something wrong with my eyes after the drive, because she didn’t look big, or shiny or new – I blame the weather! 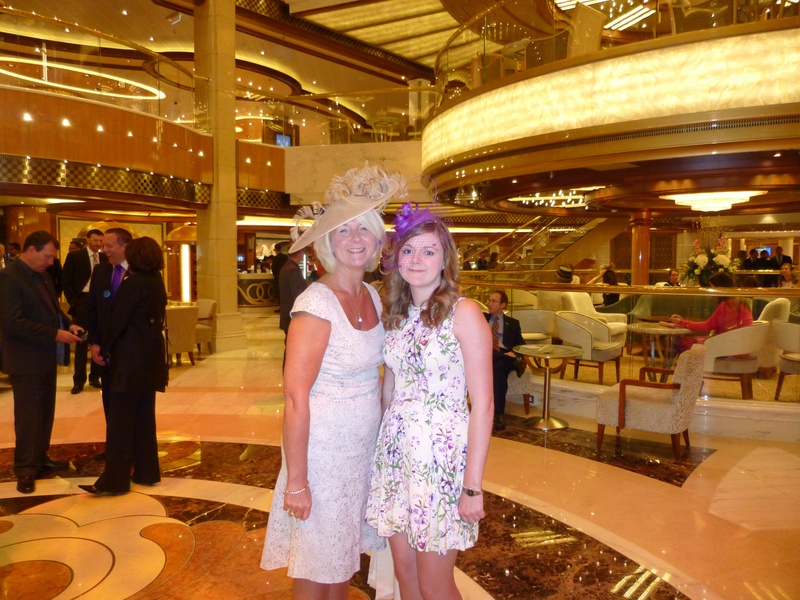 I just thought she was a Princess ship – not very observant of me! So, I carried on sorting my things out before taking a walk up into town. When I arrived back at the hotel Lizy had arrived and as soon as we got to the room I puzzled as to why the Princess ship hadn’t left yet? Lizy was quick to inform me that it was Royal Princess and wasn’t due to go anywhere. Oh yes, so it is! Maybe I have been working too hard of late lol. So, having now established that she is in fact the newest edition to the Princess Cruises fleet I stood and looked at her for a while. I think I am just so used to the sight of a ship at Ocean Terminal that I didn’t think too hard about it at the time. I had tried to compare her size to the terminal building but unless she was behind Azura,or another ship. I had nothing in real ship sizes to compare her too from a distance. But on reflection, you can see that she would actually tower above the likes of P&O Azura. Well, I’m glad the mystery of what ship she actually is has been settled. Later in the evening we walked down to take a closer look, and yes I could see she was big but beautiful. We carried on for a cheap and cheerful meal at Pilgrims House. I think the waiter was a little surprised that we just ordered the starter and one main each, as it is ‘all you can eat’ but my belly is quite full enough. its good for wheat it is but Oceania Red Ginger it is not! As we passed Royal Princess again she was all light up and looked pretty spectacular, and tomorrow we would be able to see for ourselves. So the morning has arrived and we embark Royal Princess today for a Gala evening onboard before tomorrow Naming ceremony conducted by Her Royal Highness the Duchess of Cambridge. The weather was not being kind to us today and we sat and had a coffee before our booked taxi arrived dead on the dot of 2.00pm to take us the short distance to the terminal. It was all very calm at the terminal. 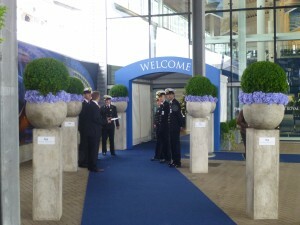 Cadets lined the blue carpet leading into the terminal and each greeted us as we went through the door. We were directed up the escalator to the check in area and it was deserted. Where was everyone, I knew we were very early but there are always those that arrive even earlier than us. Check in staff advised that we could go straight onboard. I was impressed as time was precious. I was a bit worried about my hat box being sent through the scanner for fear of it getting crushed, but an army of female security officers were already on it, all keen to be the one to ‘inspect’ the contents of the big hatbox and carry out a verdict on the hat. They all approved, and nearly forgot to look for suspicious devices. Next we were met by the ships security officers all armed with a new type of hand held scanner which took our security picture and scanned our cruise card. Then we were onto the walkway snaking our way onboard. The Band of the Royal Marines was practicing below us and it all felt very exciting. 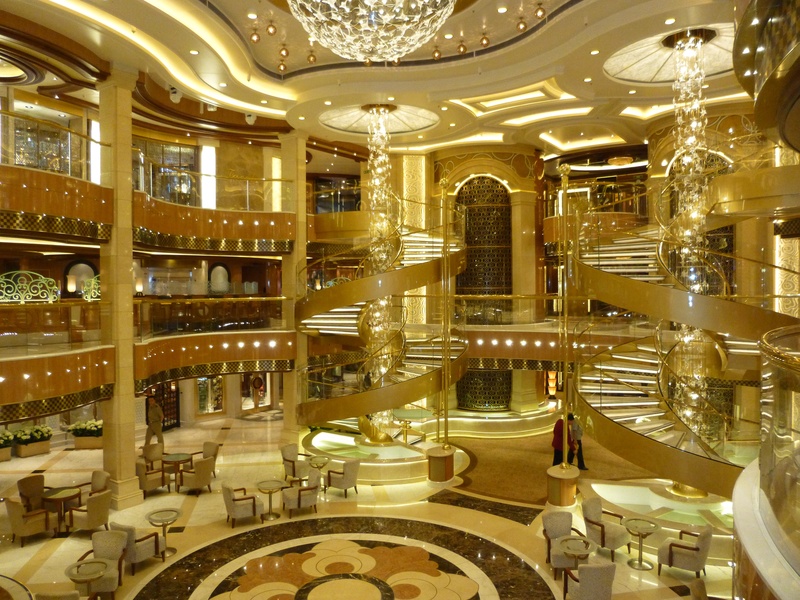 Oh wow, our first glimpse of inside Royal Princess was the Plazza. It was buzzing with visitors, people taking photos, just wandering about trying to take it all in. 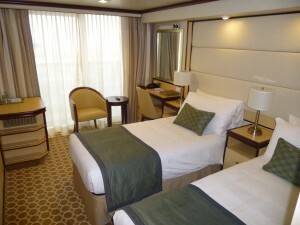 We were directed to the lift, out at Riviera deck and we soon found our balcony stateroom R541. Remember that number – because I didn’t!! I didn’t know what type of stateroom to expect as I had not yet learnt all the cabin numbers of the vast Royal Princess deck plan. Anyone that knows me will be aware that I am a bit of an encylopdia of cabin grades, numbers and locations. 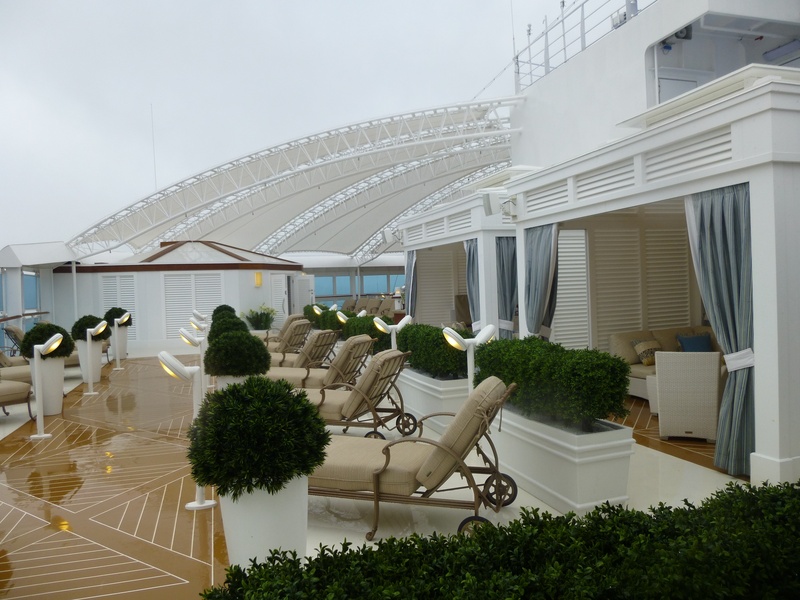 I was aware that suites were on Riviera deck, but sadly they turned out to be about six cabins along. We hadn’t even put the key in the stateroom door and the stateroom attendant was there, ready to give me the full run down on lifejackets, muster points etc. But I needed to get beyond the door and see what was what. Lizy was already in there and I didn’t want her creasing the bed linen or putting something out of place before I had chance to take a photo. Eventually the cabin stewards obligatory speech came to an end and I was inside, but wait another knock at the door. It was my friendly cabin steward again keen to advise that I needed to put the cruise card into the slot to gain electricity, because this is how they designed it in the dock yard! Must have been knew to him, bless. He was lovely and always spoke every time we passed him in the corridor. So the BB grade stateroom is best described as the same pod as an Azura or Ventura standard balcony cabin. The only difference being that there was no tea or coffee facilities which freed up the space on top of the unit, which also had some handy shelving down the side. The TV was a large flat screen TV on the wall at the foot of the bed. Dressing table was same size as on P&O Azura, except it had drawers either side instead of a cupboard. Bed had a lovely cream leather type headboard. Walk in wardrobe area was the same with the long tall cupboard, with shelving and the safe. Bathroom was also more or less the same as a standard P&O shower bathroom. The sink was nicer being a moulded deep oblong shape and the shower had a lower ledge which would be handy storage shelf or to aid the shaving of ones legs – an idea stolen from Celebrity maybe? The different stateroom types are probably best described as comparisons to P&O and Cunard cabins, so hopefully you will be familiar with these. Standard B grade balcony on Royal Princess comparable with Azura and Ventura G grade cabins. The deluxe balcony cabins are more comparable with the balcony staterooms of Queen Elizabeth and Queen Victoria. Mini suite on Royal Princess comparable with superior deluxe on Azura or Ventura, or Princess Grill on Queen Elizabeth or Queen Victoria. And the Riviera deck suites on Royal Princess comparable with suites of Azura or Ventura or the Q4’s on Queen Elizabeth. Yes, balconies were quite narrow for all of these, but the C and D deck balconies of Azura and Ventura have spoilt many of us. The D grade aft balconies did have very good sized balconys but they will cost you more and are the same size cabin internally. We had a good nosey around the cabin to see what was what. 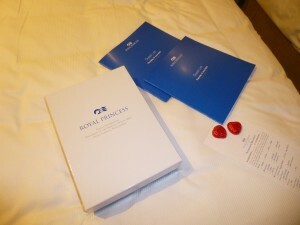 The cruise info booklet was nicely presented in a leather box type book on the dressing table. The balcony was small but adequate for catching rays and gaining fresh air. Lizy did a bit more in depth inspection than me and got quite excited by the size of the sprinker system and the size of the lifeboats, but I have to blame her time at sea for that! After quickly unpacking and putting things in a place that I hoped to find later we left the stateroom to go and do a tour of the ship. First stop was a self service laundrette would you believe? For no other reason than it was located very close to our cabin. Then we had a look in the Concierge lounge which served the nearby suites and the Wedding Chapel was next door but was closed for a private meeting. 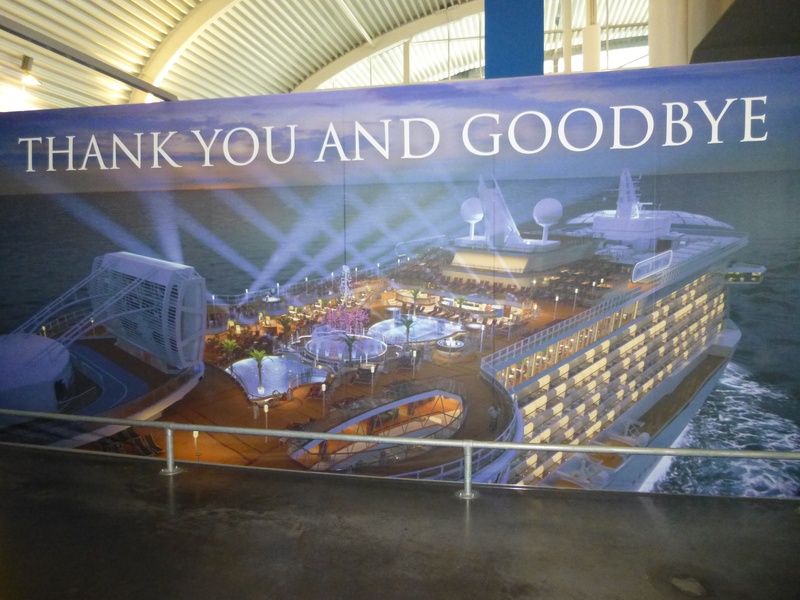 We took the lift to Lido deck and arrived in the Horizon Court. That was another distraction – food! The choice was vast with the area spilt into three areas of Bistro, Pasty Shop and Horizon Court. Each section offered a different selection of food and the seating areas had different decor. 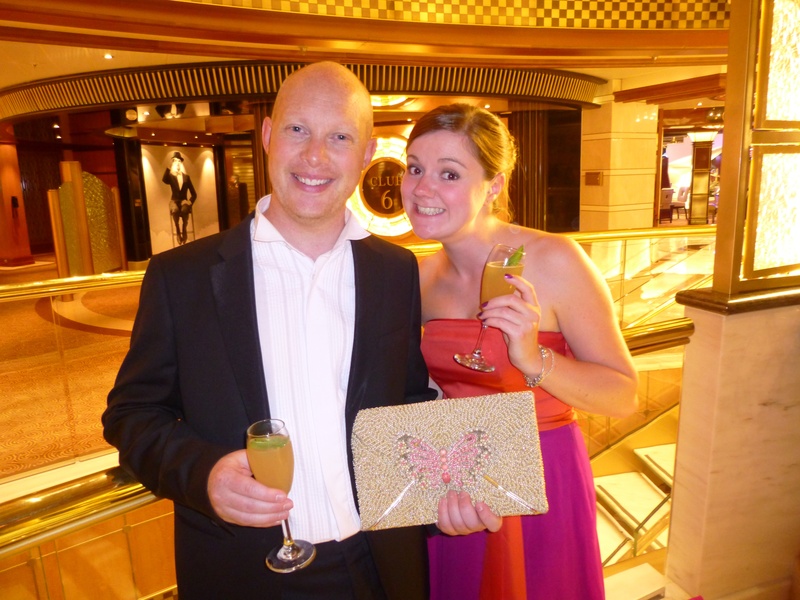 The aft deck had lovely rattan furniture and a bar, but the weather drove us back inside. We enjoyed a very light lunch with a glass of white wine. We didn’t let the weather prevent us from exploring the Sanctuary and the Retreat areas. Oh yes, I could see myself up here on a hot sunny day. The Retreat is free to use on a first come first serve basis, but the Sanctuary is bookable and has a small fee. The private cabanas were like little holiday chalets, loved them! As we were already damp from the driving rain we did our best to see the SeaWalk, Seascreen and its a shame the fountains weren’t in operation. I loved the outdoor space though, and yet more dining options offered out on deck. Time to head inside and down to deck 6, Fiesta deck. The theatre was very much what it said on the door outside, so that took about 10 seconds to look at. Next we were in Churchills Lounge, which we soon discovered was a small smoking lounge. Not much chance to look in there as there was a lot of smoking going on. Stressed PR people maybe. The Casino was huge but that’s always to be expected on a big American ship and I loved the spiral staircase that led up to the main shopping area. A sneaky way to get you to spend your winnings no doubt. Club 6 is the night club venue and looked very nice, long and narrow with a dance floor in the corner opposite the bar. We had now arrived at Bellini’s Bar which was to be a bit of a mistake. I foolishly suggested it would be almost rude not to partake in a Bellini whilst it was nice and quiet, and just chill for a moment after our dashing around on top deck in the rain. Even more foolishly I left the choice of Bellini to my daughter Lizy who selected a Royal Bellini for me. It was huge and was a mix of vodka, Galliano and champagne. I did attempt to leave after the first one, but someone had already ordered me a second. I will just say that I don’t recommend anyone has two on the trot, especially when they had about 20 minutes to get ready for the evening ahead. I honestly don’t know how we managed to turn ourselves around quite so fast. 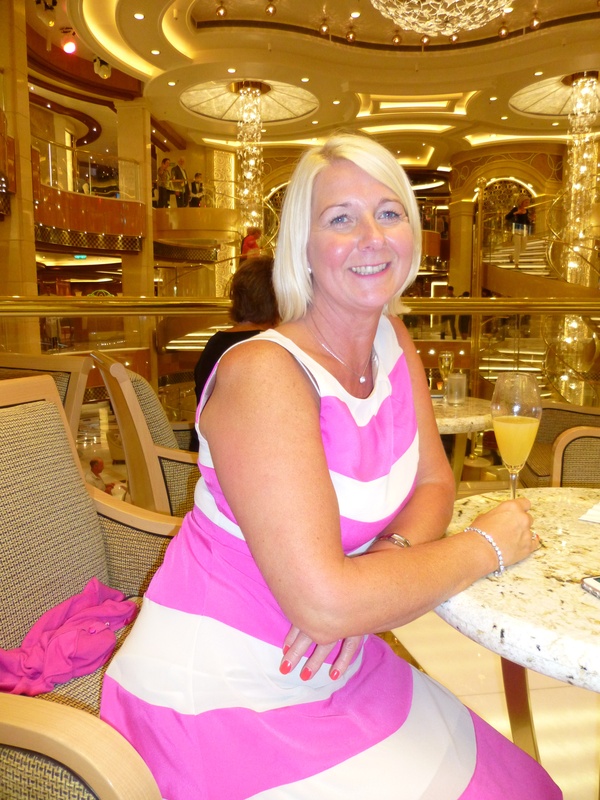 Lizy is clearly an expert in this field as she has worked at sea, and has had plenty of practice of rushing out of her office late, putting her hair up, applying makeup, adding a bit of bling and slipping on a dress. She was leagues ahead of me when it came to getting ready. Somehow though, I was out of the door before her, and yes I was fully dressed, booted and suited when I left! So, quick recap, where were we meeting for pre dinner drinks? Ahh yes, Crooners. Somehow amongst all the crowd I did find who I was looking for and before I knew it I had a champagne in my hand. Canapés were very free flowing as was the champagne. I did my usual dress spotting and who was wearing what, who was who and where etc. 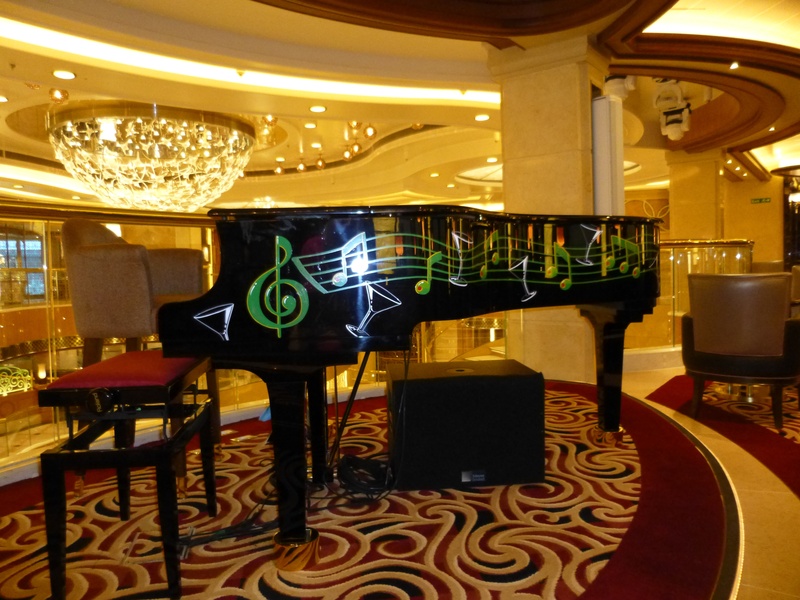 I like Crooners, a very nice cocktail bar with pianist which I would image has a very nice relaxing ambience when not quite so packed with Gala event attendees. Dinner for us was in the Concerto Restaurant so we didn’t have far to go. We were joined by four other ladies which didn’t seem very well thought out as the table next to us was all gentlemen. Maybe it was a random computerised selection. The meal was divine. Princess presentation and quality of food could not be faulted. I hear only good things about Princess food and now I see what they mean. The wine was very free flowing, maybe a little too free flowing in hindsight. And it became even more free flowing when there was a slight delay in proceedings waiting for David Dingle to make a toast and speech. You may not believe this but I left a full glass of wine and a glass of champagne on the table when I left. No sooner were we out of the door and a waiter appeared with a glass of shots. Gone of the days of an after dinner liquor then. I came over all sensible and didn’t partake. 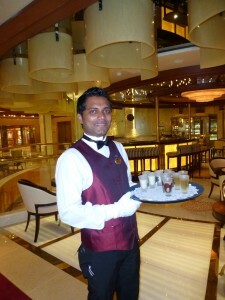 Then there was the waiter with a full tray of after dinner chocolates. Somehow I have lost lizy, so I stood and people watched in the Plazza before enjoying a performance by Beverly Knight and then Beetles Mania. Its a shame the weather was not being kind to us and we couldn’t have been up on deck, but there was a good party atmosphere around the atrium area. Those waiters with the tray of shots are still milling around. Some of them looked nice, but too dangerous at the moment. At last, communication with Lizy has been restored and she is in Bellini’s at the bar. By the time I arrive she has a round of Bellini’s to distribute. I think the eyelashes came in handy at the very busy bar. The evening was pretty much spent sipping on Bellini’s, wandering from room to room to see what was what and who was where, and then back to Bellini’s. We did venture into Club 6 which is the nightclub. It was busy in there. The menus amused me as they lit up a bit like an ipad – well at least I think they did? Maybe it was my eyes and ultra violet lighting. I needed to be seated so I took up residence on a bar stool and got chatting to an eccentric looking foreign man who turned out to be an architect. I’m guessing he was involved with the ship design in some way, but late night chat in broken English in a more than noisy packed nightclub was not a good combination. Lizy had already headed for her bed and I knew I needed to do the same. This is where my problems start. I got out of the nightclub, eventually after a bit of pushing and shoving, and was faced with the ‘which way’ scenario. I decided to head forward and I think that’s where it all went a bit wrong. I managed to get out at the right deck, but what was the cabin number again? I decided to head down a corridor, as you do, and see if I could spot it. Ah, Inspector Chadwick has a clue! I recognised a picture on the wall. I must be about right with my location?? I’m sure it had a 4 and a 5 in it? The doors were not working for me. I crossed at the next stairwell and the pictures were all the same as the previous corridor. Oh no, they repeat themselves just to confuse me. I know you are thinking why doesn’t she look at her cruise card, but I had already done that. They don’t have cabin numbers printed on them. The cabin number was on the little folder of the fold up deck plan, and that was in my cabin, not my evening bag! Ah ha, another clue! The laundrette! That was the first place we looked in soon after we boarded because it was near our cabin. So what did I do? I went in the laundrette, maybe I thought I would find even more inspiration in there. But it was all mirror image, each end had a wash powder vending machine, ironing boards and washing machines etc. I walked through the laundrette and out the other side only to more or less bump straight into Gerard Tempest the new CEO of P&O Cruises. I dread to think what he thought I had been doing in the laundrette at that time of night, especially as I had a glass of southern comfort in my hand. Time to call for reinforcements so I called lizys mobile in the hope there is a signal. Happy days, she has answered. There then followed a bit of a disagreement about our actual cabin number as despite what she was telling me I thought I knew better. She was right and I was wrong and I was pulled intio my cabin by a waiting daughter. Then there was a bit of an Ooops! Unfortunately my phone hadn’t locked as I hung up from lizy, so the last person that called me got a very unexpected call from me in the dead of the night. After an apology from Lizy at my stupidness, me and the person at the other end of the phone then had a full blown conversation about the Beetles, the ship and just a jolly nice chat. I do love my friends. There was a Naming gift on the bed for me. Lizy had already investigated. I had better get some sleep as it’s a big day tomorrow. Ooh dear, my head. It was not even 6 o’clock. If I went back to sleep would I sleep through and miss the Naming Ceremony and the Duchess of Cambridge? Or would there be some almighty booming announcement relayed through the cabin advising us it was time to get up and get our hats on? I couldn’t risk it, I had to get up, and anyway I had an unfinished mission of the rest of the ships tour to complete. Somehow I got myself up and dressed and out of the cabin armed with my camera and pocket map of the ship. Little map served two purposes, as it had the stateroom number on the front. Oh how I could have done with that at silly o’clock this morning trying to find our cabin! I arrived at the lift at the very same time as a young man. Was he just going to bed? It was early and I couldn’t quite get my head around it. He looked far fresher faced than I felt and he explained in the lift that he was actually part of the band that will be playing during today ceremony, and he was off to rehearse dockside. Now I understood why he looked brighter than me this morning. The sound of live music next to your ear hole at this time of the morning would not be good with a hangover. First stop for me was Plaza Deck 5 and once more it hit me how stunningly beautiful the Plazza is. I was so lucky to see it in all it beauty, very serene and calm, without people rushing around everywhere, or leaning on the railings to look down at the activities below. There were people about, there was actually a whole army of stewards and cleaners refreshing every part of the ship. No cushion was left unturned, seat cushions were taken out, chairs hovered, cushions plumped. Table tops and table legs polished. I’m thinking maybe the Plazza floor suffered some sort of damage last night given the amount of senior officer types inspecting it this morning. Maybe it wasn’t built for a lot of dancing into the small hours of the night, who knows? Clearly the problem was fixed as it seemed fine when I stood around on it a few hours later. I slowly worked my way upto the next deck to check I hadn’t missed anything there, and I hadn’t so I went up another deck and found myself in Crooners where I had been for pre dinner drinks the previous night. But wait, there is a deck full of other public rooms for me to explore here. Princess Live is the first purpose built TV studio at sea. It’s used for all sorts of things such as cookery demonstrations, talks and lectures and interactive shows. I loved the seating in the Princess Live Cafe just outside, high back cocoon shaped leather chairs and comfy sofa’s. Beyond there was a small library and then the Wheelhouse Bar with Crown Grill which serves pub style lunches and a varied menu in the evening which includes sterling steaks and premium seafood dishes, there was also a little annexe where I presume larger partys could pre book and dine. Really not sure as there was not a lot of people around at that time of the morning to ask. I am staring to get funny looks from the army of cleaners that are about though. I don’t think they can quite work out if I am lost from the night before, or otherwise just very odd for being up so early. The Vista Lounge at the aft was a large lounge used mainly for cabarets and dancing. I nipped outside, and you guessed it there were men cleaning steamer chairs and making sure they were placed to precision. I suppose this was a portion of a Prom deck type place. It literally was the last portion of the aft of the ship and wrapped around the back, but going forward it was gated off as it was where the lifeboats hung. I think there was more open deck space on this level more toward midship. One place I hadn’t checked out was Chefs Table Lumiere which is tucked away in Allegro Dining Room, so I nipped down there to take a look. 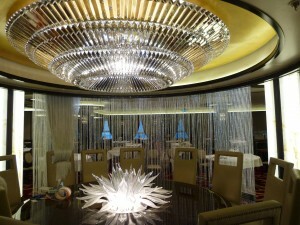 Lumiere offers an exclusive dining experience within the Allegro Dining Room. The amazing glass table, with huge sculpture in the centre, becomes enclosed in a curtain of light whilst diners experience their meal. So back in the lift and upto top deck, all good except I just got in the lift with a dog and three policemen. I don’t know who was more shocked? Me at seeing the dog, or the policemen at seeing a woman in a bright pink dress at stupid o’clock. The dog had a good old sniff of my feet and legs and I wasn’t going to argue with him, after all I guess that was his job. Dog and policemen got out at the Horizon Terrace but was in search of the children and teens facilities. They didn’t exactly jump out at me at first as they were down a wide grey corridor, which I guess was designed to be trendy. 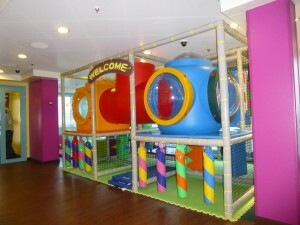 The kids facilities were fantastic. Each age group had their own dedicated area of both inside and outside spaces. This just confirms to me that Princess is absolutely excellent for families. 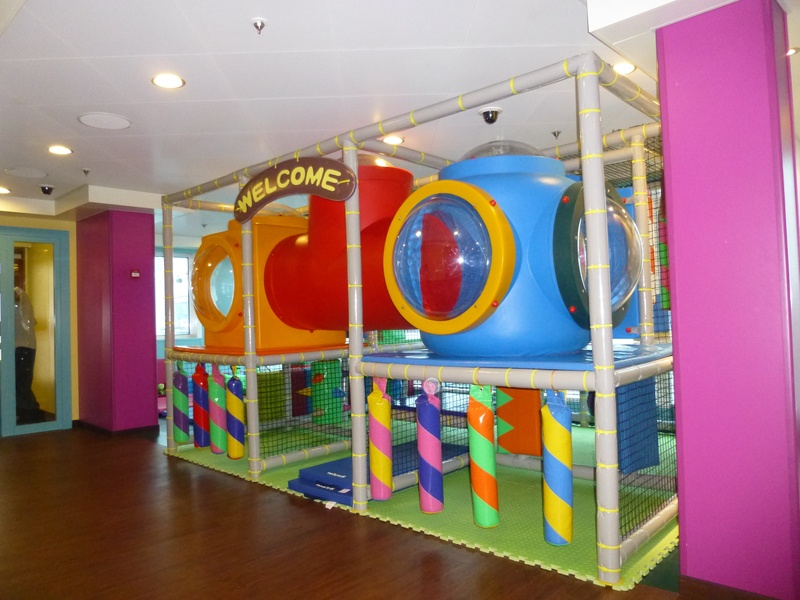 The tots room was brightly coloured and loads of activities inside and out, plenty of space to let off steam. At the other end of the scale the teens room was a cool chill out zone, with a very cool and trendy outside deck area and Jacuzzi. I think my mission for the morning was complete, so time to reward myself with a coffee. Back down to Plaza deck to International cafe for a much deserved coffee latte. It was beautifully presented and they were quite busy with take outs for PR and press people who obviously had things to do this morning. the policemen and their dog was back and he was having a good old sniff of the pot plants. He had a right go at one of the plants outside Gelato and the policemen were straight in there and didn’t hesitate to pull about at the plants to satisfy themselves that all was as it should be. I’m sure someone else followed on behind and reassembled and tidied after them. So, after my coffee, did I feel any better? Well no not really. Perhaps a lie down would help, so I returned the cabin (I know where it is now) donned my Pj’s and got back under the duvet. And then came the voice of Lizy “Did you bring me any breakfast back” Oh kids! Why did she plant that seed in my head? I was in need of bread rolls and sausage. Food would make it all seem better. I got up and dressed again and headed to Horizon Court. There are people booted and suited and ready for the Naming Ceremony? Are they crazy or is that me? its barely 8.00am and they are donning their finery. 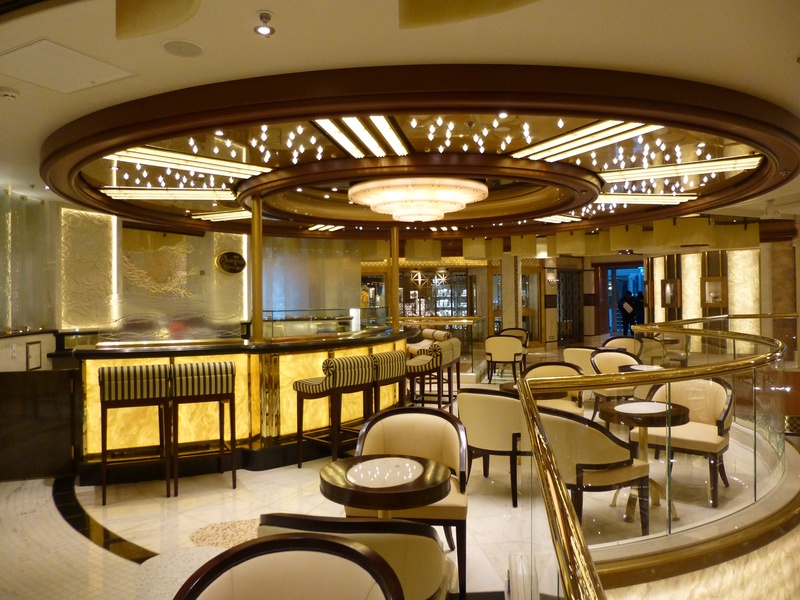 Now, anyone that knows me, knows that I am not a lover of self service buffets at sea (Oceania Cruises excluded) I just can’t seem to negotiate the places at all. So I decided to do things logically and investigate all three sections of Horizon Court. Im not really seeing sausages, just ‘link’ sausages which are tiddly tiny spindly things. Bug fat pork sausage was what was required, but as non were making themselves known to me I opted for a plate of those. Next I need a bread roll. I have seen a few dotted around but non to my specific requirements, so I headed to the pastry shop thinking that the most likely place for baking a bread roll. Plenty there but still no soft white rolls. A head waiter asked if he could assist and I asked where I would find soft white rolls? Breakfasdt rools? No, it wasn’t going well so I picked up two crusty looking things best suited for dunking in ones soup at home. Sausages – check, bread rolls – check. Now I need ketchup. Head waiter man was on the case again and instructed me to sit and a waiter would bring to me. No I had to deliver them to a hungry daughter. So he hailed a waiter to bring the ketchup. Oh no, it was a new glass bottle of Heinze Tomato ketchup. The waiter thought if he just tipped it up it would come out, but I knew that would never happen. Then he started whacking it on the base and aiming it half at me and half at the plate. I was scared for the safety of my bright pink dress, it wasn’t going well. As soon as he achieved a blob no bigger than a 10 pence piece I thanked him and hot footed it back to the cabin. But it was a wasted effort, the sausage had gone cold and the bread was indestructible. No way were those three elements making a sausage batch. Lizy managed to cobble a bit together but I hadn’t the energy. Shower time, time to be booted suited and in the Plaza ready to disembark. We were fashionable late and many had already started to disembark. I liked the announcement advising that it was rather windy and chilly on the dockside so ladys may like to wear a ‘nice’ coat and gents a ‘pullover’ But what if someone took a ‘horrible’ coat with them? And were men to wear their pullover on top of their suite and decorations? It was just the image that was conjured up in my mind at the time! We eventually made it down the gangplank and it was a definite hang onto your hat moment at the bottom. 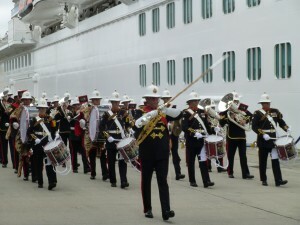 The Band of the Roayl Marines were just marching by as we were ushered into the baggage hall. It was all a little odd. 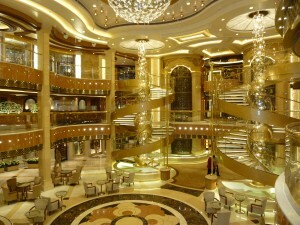 Why were we in here sipping champagne when we could have been in the stunning Plazza atrium of Royal Princess. There were a few flowers around and banners and things but I knew I was in a cold, echoing baggage hall that was full of chatter and we all looked very out of place in out finery. I had a rather refreshing ginger and elderflower drink which seemed to hit the spot and revive me a little. We were shut in and I wasn’t liking it, it was alot of people and now the shutter door had gone down. Maybe we were to walk out of the other exit? Eventually the roller door went back up and it dawned on me what was going on. We had to clear the ship and be shut in the baggage hall whilst the Duchess of Cambridge arrived and embarked Royal Princess. We took the walk to the far end of the baggage hall and out into the chilly wind again. Hold onto your hats! Naming Ceremony booklets were being handed out and pashminas for the ladies. We were also offered disposable plastic rain mac type things but no way was I donning one of those and anyway, it wasn’t allowed to rain. We found suitable seats towards the bow of the ship, right opposite the bottle and with a good viewing point of the proceedings. I was summoned to the end seat of the row, as the others refused to have the feathers of my hat in their face. Oh it was exciting. I didn’t know which way to look. 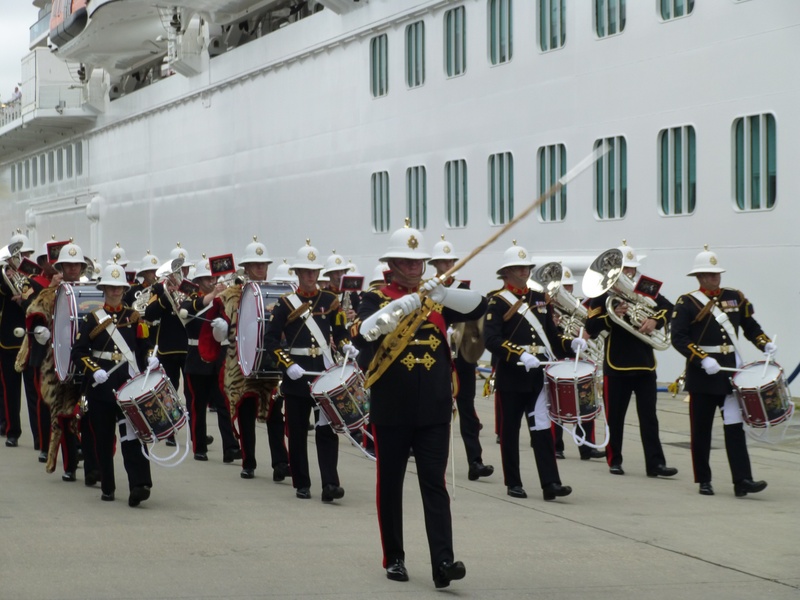 The Pipers of the 1st Battalion Irish Guards got things under way, closely followed by The Band of Her Majesty’s Royal Marines Portsmouth. 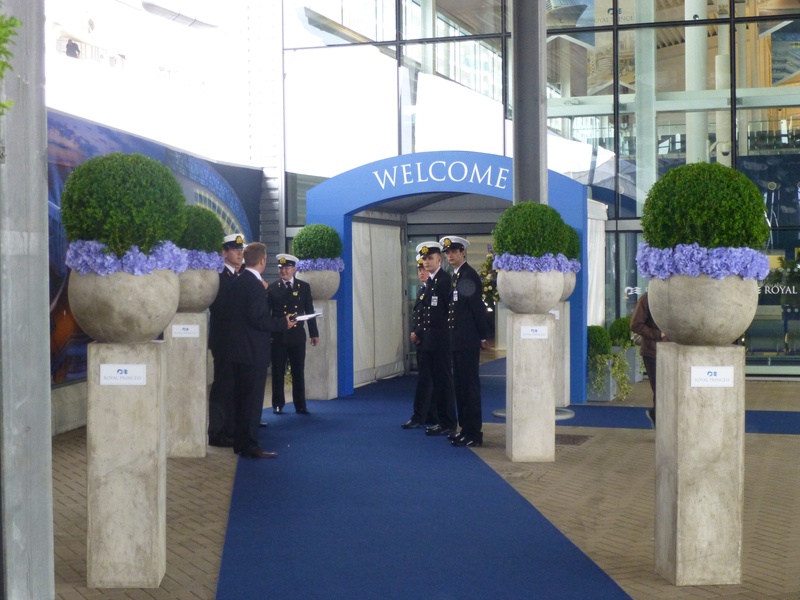 But hush, there is an announcement – the arrival of Her Royal Highness the Duchess of Cambridge. I still couldn’t see her in the flesh yet, only via the big screen that was in front of me. Oh she looks lovely, but quite nervous and a little alone. I’m bet she is wishing she had Prince William at her side, so do I! I wanted to see him. Shame she couldn’t bring a girlfriend or something. I wonder if she asked. I would have, but then that’s me and I’m not a Duchess Naming a ship! She was seated with all our faces staring at her and lots of cameras being pointed at her. Natasha Bedigfield perfomed Unwritten and Mass Ensemble played their very oversized instruments. I think the strings player girl in the flared short skirt was really wishing she hadn’t worn that today as there was little she could do to stop the wind from taking control of it. Kerry Ellis performed with Mass Ensemble. Now its time for the serious bit. Alan Buckelew, President and Chief Executive officer of Princess Cruises welcomed us all to this proud day for Princess Cruises. 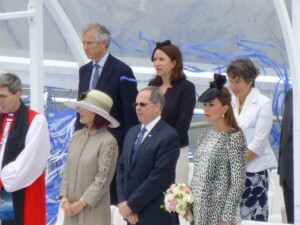 He is pleased that they chose to name Royal Princess in Southampton and I have to say that I’m pleased too. 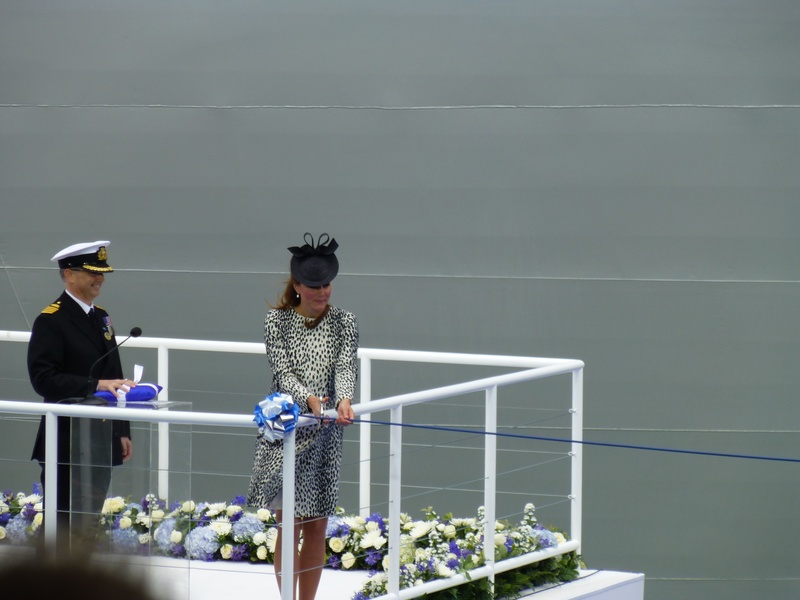 After a blessing by the Right Reverend Tim Dakin, Bishop of Winchester, Captain Draper addressed Her Royal Highness the Duchess of Cambridge and invited her to do him the honour of naming his ship! That raised a giggle and no doubt put Kate at ease. The scissors were presented by brother and sister Isobel and Charles Rowbottom who represented the EACH children’s charity, one of the young peoples charity’s present. 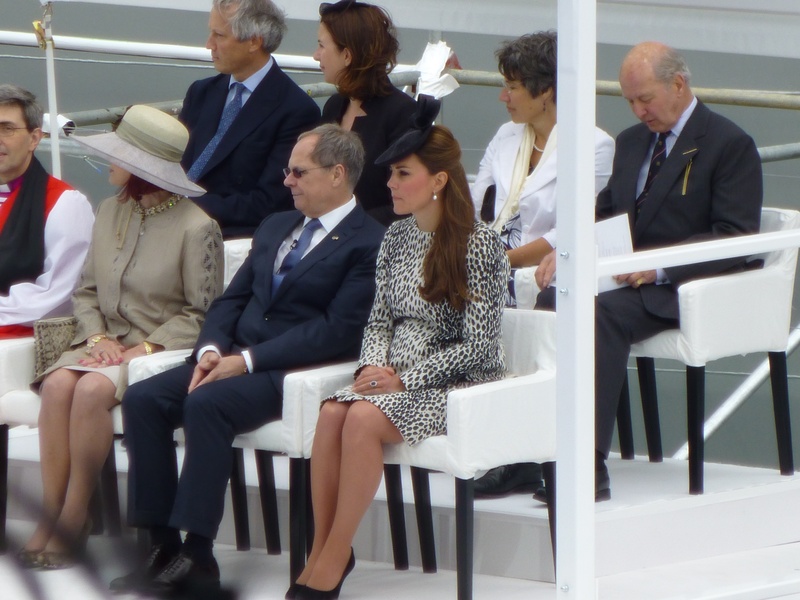 Kate climbed the few steps up to the podium and said the traditional famous words “I name this ship…. Royal Princess” The bottle went with an almighty smash as she cut the ribbon and the confetti boomed into the sky above her. Blue and white confetti rained down on her and across the bow of the newly named Royal Princess. She looked relieved. She had well and truly blessed the ship and I know the bottle breaking means a lot to all who sail on her. After a presentation of flowers from Amy Templeton, deck cadet, Her Royal Highness was escorted back to the car and whisked away. I did wonder if she just sits in the back of the Range Rover all the way home alone with nobody to chat too. Maybe she got on the phone to William or her Mum and told her what she had just done. It also crossed my mind that she might like to do something ‘normal’ like take a Princess Cruise for a holiday, but her new lifestyle would prevent that I guess. 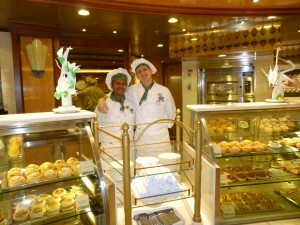 We all headed back to the ship for a light lunch served in the Concerto Restaurant. At first glance it seemed rather an odd selection of food for such a grand occasion but it was very welcome fayre. I opted for the prime beef burger and fries, but there was fish and chips, soup and roll, plougmans lunch. Wine was free flowing, and why not, hair of the dog and all that! yes, I felt better for all that. Oh I wish we could stay onboard for another evening. A nice rest and a nice night out would be most welcome now. I still had things I needed to see, such as the dancing fountains and the venues and shows that Royal Princess had to offer. I had already packed the case earlier, so there wasn’t much to do at the cabin. I stored the hats safely back in the hat box whilst lizy completed all pre disembarkation checks and we were soon heading back down in the lift to disembark. Goodbye Royall Princess and thank you for an amazing event! There were no waiting taxis, just a couple of complimentary coaches heading to the car park and the train station, plus a whole fleet of silver Mercedes waiting to take the VIP’s home. Why didn’t we have the VIP treatment? I had called for a txi and it was just as well. Christopher Biggins was just infront of us, two cadets were carrying his suit bag and case and a senior manager from Carnival House was escorting them. They really do get looked after, they loaded his merc for him, made sure he was sat comfortably and then waved him off as the chauffeur drove away. I got kisses from said senior manager so really can’t complain. In fact I have heard only good things from all my clients that returned from Royal Princess post naming mini cruise. All Princess clients continually give me excellent feedback when they return from their Princess cruise, so clearly they are getting most things right. I think Royal Princess will quickly become a firm favourite in the Princess fleet, and I hope to cruise on her in the not to distant future. 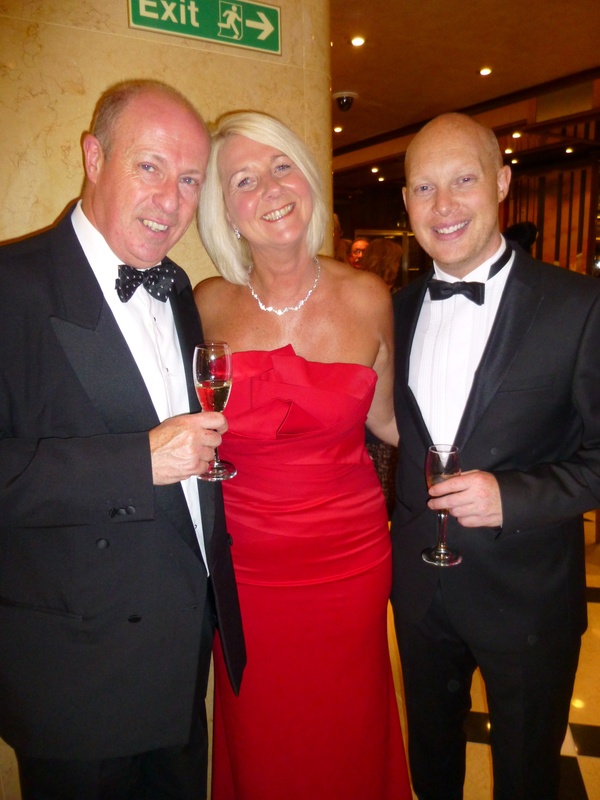 Look out tomorrow for a full blog of a very valued clients experience onboard the Royal Princess post naming cruise 14th -16th June 2013. Its a great review and well worth the read!